Charolais bulls met a solid trade at a packed ringside in Welshpool on Thursday 11 November peaking at a top of 5,200gns twice and establishing two new centre autumn records at the breed society’s fixture with 51 lots selling to average £3,341.70. First entry bid to 5,200gns was Wesley Debonair TI +25, SRI +29 a rising two year old from Wesley Estates, Markfield, Leicester. Sired by Balthayock Aesop whose 20 sons have sold for Wesley during the last two seasons to average 4,200gns, he was out of a homebred dam by the 20,000gns Perth champion, Thrunton Trojan. Earlier in the day Debonair was awarded the championship, the first ever for Wesley at Welshpool. “This entry stood out as soon as he came in to the ring, he was very long and very correct. He’s a real bull for the commercial man and the sort I would take home for myself,” said judge, Will Palmer. Debonair was knocked down sold to Peter and Mary Heard, Oakhampton, who also paid 4,200gns for the reserve champion, Trefaldwyn Embark TI +28, SRI +32, an 18 month old from Arwel Owen, Foel, Welshpool. An Edenhurst Shogun son, he was out of a homebred dam by the 11,000gns Haymount Jetstream. “We were looking for growthy bulls with length, height and good conformation to run with our 300 cow suckler herd which leave the type of calves our repeat buyers want to finish efficiently, and these two lots fit the bill,” said Peter Heard. Later in the day, Mr Owen offered Trefaldwyn Everest TI +41, SRI +48 for 4,600gns to EI Lewis and Sons, Forge, Machynlleth. This 18 month old was by Trefaldwyn Usk, a Dingle Hofmeister son and his homebred dam going back to Edenhurst Shogun. The day’s second 5,200gns call was made by EG Morgan, Sennybridge for Pennal Express TI + 35, SRI +39, a 20 month old by Dingle Hofmeister and out of a homebred dam by Maerdy Grimaldi. Bred and exhibited by Alwyn Rees, Pennal, Machynlleth who received his highest price in 20 years of exhibiting at Welshpool, Express was no stranger to the ring having secured the reserve male title at the Welsh National Charolais Show. Two first prize entries were bid to 5,000gns. First to go was Moelfre Exclusive TI +25, SRI +32, a 22 month old from Kevin Thomas, Capel Iwan, Newcastle Emlyn sold to DH Parry, Llanwddyn, Oswestry. 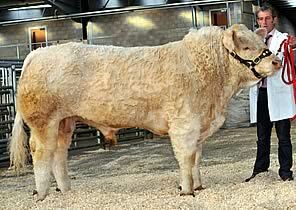 A Gretnahouse Vigorous son, he was out of a homebred cow going back to Killadeas Jack. Next at 5,000gns was Brynffanigl Elvis TI +18, SRI +24, a 17 month old from Bob Roberts, Ucha, Abergele to Will Owen, Braich y Saint, Criccieth. Sired by Alsnow Almighty, he was out of a Doonally New sired homebred dam. A bid of 4,800gns secured the first prize winner, Seawell Equalizer TI +34, SRI +43 for ER Matthews and Son, Felindre, Knighton. Bred and exhibited by Peter and Sheilagh Donger, Foxley, Towcester he was by the homebred Seawell Vainqueur. The Dongers went on to sell a string of three more entries, each by the 30,000gns Thrunton Voltage. 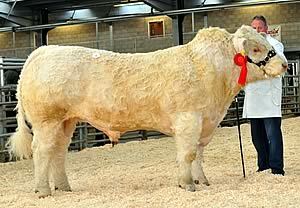 At 3,800gns, the 18 month old Seawell Endorsement TI +30, SRI +37 went to TW Jones, and Son, Llangunllo, Knighton. Seawell Emir TI +34, SRI +42, a 19 month old was knocked down sold to EJ Williams and Sons, Trefeglwys, Caersws and Cornish producer, GJ Smith, Trewidland, Liskeard paid 3,500gns for the 16 month old Seawell Enrico. David and Louise Barker, Nuthampstead, Royston were once again making a successful 240 mile round trip to Welshpool. Their 20 month old Burradon Talisman son, Caylers Enterprise TI +21, SRI +30 made 4,800gns to P and M Davies, Trawllong, Brecon, while Caylers Ecuador TI +35, SRI +41, a 19 month old by the 6,500gns Maerdy Uniroyal and out of a homebred dam from their 30 cow herd, made 4,400gns to RW Owen, Cardolbenmaen, Gwynedd. Highest entry at 4,600gns from Flintshire vet, Esmor Evans, Mold was Maerdy Emlyn TI +19, SRI +25, a 19 month old by the 55,000gns Thrunton Voldemort and out of a homebred dam by Glencardon Piper. The buyer was K Emerson, Thringstone, Leicester. Next at 3,800gns was Maerdy Ergyd TI +21, SRI +25, a 19 month old Maerdy Padirac son selling to BA Williams, Llanfair Pwll, Anglesey. Alwyn Williams, Pistyll, Pwllheli offered his 18 month old Castlellmawr Endaf TI +23, SRI +28 for 4,500gns to JE Evans and Son, Rhayader, Powys. Sired by the 10,000gns Gwenog Vindicator, he was out of a homebred dam by Maerdy Respite. Two lots shared a 4,000gns bid. First to go was Montgomery Enterprise TI +24, SRI +27, a 19 month old by Tullygarley Attaboy and out of a homebred dam from Roberts and Jones, Llangadfan, Welshpool to RA Meddins, Trefeglwys, Caersws. The second 4,000gns call was made by AW Mathews, Alkington, Whitchurch for Dorcas Emperor, an 18 month old by Blelack Topgun and out of a homebred Maerdy Ozone sired dam from George and Claire Morris, Easington, Aylesbury. Temeside Echo TI +39, SRI +43, a 20 month old by the 10,000gns Thrunton Bravado and out of a Shamleys bred cow from Paul Burgess, Upper Rochford, Tenbury Wells sold for 3,600gns to RJ Kinsey and Son, Dolwen, Llanidloes. The female trade was led by a couple of maiden heifers from the Pennie family, Glyn, Chris and Nigel, Llandyssil, Montgomery. At 3,000gns Sarkley Elreeka, an 18 month old by Billingley Siralex and out of a Doonally New sired homebred cow was secured by JW Power, Caereinion, Welshpool. Minutes before the Pennie’s Sarkley Eneeka made 2,600gns to WG Williams, Croesor, Penrhyndeudraeth. This 19 month old was by the 5,600gns Hendy Archiemac and out of a homebred cow by Oldstone Egbert. Averages: 51 bulls £3,341.70; 20 females £1,399.13.